Goo.gl, or Google URL Shortener, is a URL shortening service from Google which squeezes makes a URL or links (hyperlinks), which typically very long for search engine optimization, into shorter URL with fewer characters. Shorter URL conserves space, which is important for limited-characters services such as Twitter’s tweets, status updates of microblogging, and other modes of short form publishing. Stability and reliability – with Google’s scalable, multi-datacenter infrastructure, the service will have good uptime, and avoiding linkrot when service is down. Security – shortened URLs are automatically checked to detect sites that may be malicious and warn users when the short URL resolves to such sites, protecting users from malware and phishing pages. Speed – fast resolution of short URLs. 301 Redirect – Google URL Shortener redirects short URLs to original URLs with HTTP Status Code of HTTP/1.0 301 Moved Permanently, so that all link juice, PageRank and other SEO metrics that affect SERP (search engine ranking position) is passed to official web pages. According to Google Blog, Google URL Shortener is not a stand-alone service, and is currently available for Google products and not for broader consumer use. 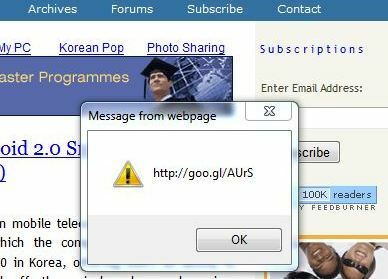 Which means user can’t go to http://goo.gl/ hoping to enter a long URL to get the shorten URL starts with goo.gl directly, nor it’s possible to track list of URLs which are using the Google URL Shortener service. Google Toolbar (available for IE and Firefox) – New version of Google Toolbar includes a Share button, which allows users to share any web pages from the Google Toolbar to Twitter, Blogger, Delicious, Digg, Facebook, Gmail or other services. When a link to the page is inserted, it will automatically shortened by Google URL Shortener. FeedBurner – Socialize service automatically tweets new feed items to Twitter, with links to the feed items shorten by the Google URL Shortener. goo.gl lite (Firefox Add-on): Let users use Goo.gl, Google’s URL shortener without installing Google Toolbar. After installation, user has to right-click Firefox toolbar, click “Customize”, and drag the Goo.gl button to a toolbar. Clicking it will make a goo.gl URL and copy it to clipboard, which can then be pasted to everywhere. goo.gl url shortener (Google Chrome or Chromium Extension): Allows users to shorten the current website URL with the Google URL Shortener service. Once compressed, the URL is automatically copied to clipboard and user can share it with twitter, facebook, blogger, gmail or default mail client. The, simply click the goo.gl Bookmarklet from Favorites or Bookmarks on the page that the URL wants to be shorten. A pop-up dialog box will display the short slim URL based on Google URL Shortener service.